The only way to truly experience the best of the Shenandoah Valley, and Sherando Lake is to stay in a river cabin surrounded by the sights and sounds of nature. You won’t find a more peaceful feeling than hearing the bubbling sound of the river waters flowing outside your cabin window. Cabin Creekwood offers cheap family getaway cabins in the best location in the Shenandoah Valley. Each cabin is unique and features its own style and layout; Cabin Logwood is actually a Civil War Cabin, fully refurbished and outfitted with modern amenities! Imagine a place where you can see deer and other wild animals playing in the forests and enjoy the secluded remoteness of your location. You will not find over-development at Cabin Creekwood, at Sherando Lake. Where exactly is Sherando Lake and this amazing natural playground? Why in the George Washington National Forest, less than 5 miles from the Blue Ridge Parkway via VA State Route 814. On Sherando Lake you can fish on the public dock, swim, picnic and there is a Sherando Lake Campground nearby for those that want to spend a night under the stars in a tent. Our cabin resort is minutes from Sherando Lake. Also, another natural playground nearby that guests love exploring the trails in is the Shenandoah National Park. In fact, our little corner of the world is known for being a major hub along the Blue Ridge Parkway / Skyline Drive / Shenandoah Valley National Park at Rockfish Gap where US 250/I-64 flow through as well. Rockfish Gap, elevation 1,900 feet, is a wind gap that was once a travel hub, but now is mostly just a spot known for being an entrance to Virginia’s Skyline Drive. 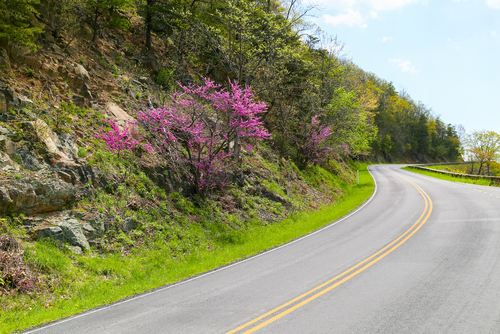 If you’ve never driven portions of this scenic highway, it’s definitely worth a Sunday drive. Be sure to bring along your camera, you’ll want to stop and snap shots all along the highway which snakes through some 200,000 acres of protected lands. Cabin Creekwood, Sherando Lake cabin rental resort is the perfect place for individuals seeking respite, couples, families with young children or teenagers and older adults. We welcome guests to check out each of our cabins and let us know if you have any questions. Or, give us a call and check availability and we’ll match you with the Sherando Lake Cabins that are perfect for your stay.